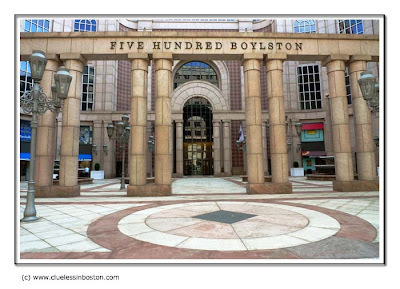 This week's doorway is the building at 500 Boylston Street, which also happens to be the building used as the setting for the television series Boston Legal. The series just ended its five year run on American television. How fun. I had a business meeting in this building last summer, which was my only trip to Boston in about a dozen years. And I have never watched the show and was clueless about the building being on the show. Thank you for educating me. For a second there, I thought I had clicked on the wrong city! Gorgeous building! I'm afraid I don't watch TV at all so this is new to me. What an impressive entrance. I, also, am 'clueless' about tv. But the photo is sure grand. this is ironic as all get out because as i was reading the comments that your readers (lookers?) have posted, i was thinking to myself that i, too, am clueless when it comes to tv and that i don't watch much of it. and this was JUST after i had posted today's post on MY blog - have a look, Clueless. anyway, as for your picture: one word - GRAND. Betimes I'm watching "Crossing Jordan". Do you have any shooting locations, too? Is true, is just that! But yours is most beautiful !!! That is impressive! Love the framing, too! Beautiful! Makes me want to walk down Boylston. This lovely doorway looks like a postcard in how it's framed! Looks perfect for a nice afternoon tea dance.